- Available in capacity ranging from 10 kilo liters to 100 kilo liters. Pressure :As Per Client Req. 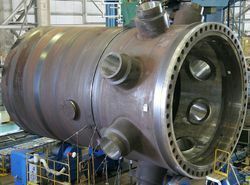 With our in-depth knowledge and experience of this industry, we are engaged in manufacturing an excellent range of Tank Reactor. In most of the glass plants, vessels are used as reactors, receivers, separators, measuring or feed vessels. Glass Reactor are available in Spherical Shape from 5 to 500 liter and in Cylindrical Shape from 5 to 500 liter capacity. 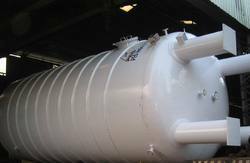 Cylindrical vessels can be supplied with metal/glass jackets too. This Chemical Reaction Vessel with Twin high efficiency agitators for a client.. We provide customized and innovative multidisciplinary design solutions across the globe. Our committment to serve a racemic mixture of conventional and creative elements in design development has created many success stories over the last decade.